Microscope Enhanced Dentistry | Dental Health Care of Woburn, P.C. Establishing a new level of dental care to improve treatment success and patient comfort. Experience the advantages of the next level of skill in dental care. It is said an image is worth a thousand words. So how much is a magnified image worth? To a dentist, practicing microscope enhanced dentistry, priceless. Dental microscopes enhance the quality of a dentist’s work, deliver more aesthetic outcomes, and provide long-term health benefits for patients. The built-in camera and video features allow you to be more involved in the treatment process and see what your dentist sees. When will your Woburn dentist use a microscope? Most people are nervous before a root canal, not knowing if they will have to return for a re-treatment or experience pain after the procedure. A dental microscope can dramatically improve the success rate for root canal therapy. At every stage of the endodontic process, treatments are far more precise, and outcomes are more predictable than ever before. Locating the problem: Your dentist needs to examine inside your root to determine precisely where the root canal is needed. Microscopic dentistry makes it a breeze. Cleaning the root: Problems can arise when a dentist does not adequately clean the root at the end of the therapy. A dental microscope makes sure you won’t experience any additional discomfort or require repeat appointments. Assessing the tooth surface: Microscope enhanced dentistry can enable your dentist to identify cracks, root fractures, and other issues that need addressing. You will be confident knowing it’s done right the first time. Preserving tooth structure: When equipped with a dental microscope, a dentist can remove minimum tooth tissue, keeping your tooth stronger and healthier. When dental crowns are prepared with a microscope, results are more accurate, meaning patients will experience a longer lasting restoration and a more natural feeling fit. Microscopic-enhanced dentistry can even improve the success of your next filling. Your dentist can identify cracks or decay that won’t be seen with the naked eye or dental loupes. There are times when no magnification is necessary for routine procedures. Dental loupes are used by dentists for enhanced magnification. Higher magnification from a dental microscope provides enhanced visibility for procedures like root canals and crown preparations. Most general dentists don't have a dental microscope, but we do. If your dentist isn't using a microscope, you won't experience the advantages modern technology has to offer. With microscope enhanced dentistry, you’ll spend less time in the chair, especially for a root canal procedure. You’ll be confident it’s done right. Improved illumination and magnification means your dentist can deliver better-executed root canals and crown preparation for a more precise outcome. Microscopic dentistry ensures your dentist can find issues early to prevent future appointments and more expensive procedures down the road. Most general dentists perform root canals using only dental loupes that only provide 2.5x to 3.5x magnification. However, restorative dentists and endodontists always use a dental microscope to perform root canal therapy which offers up to 16x magnification. How does your dentist’s improved vision benefit you? Better visualization for the dentist means better quality restorations, less invasive procedures, less discomfort, and shorter healing times. 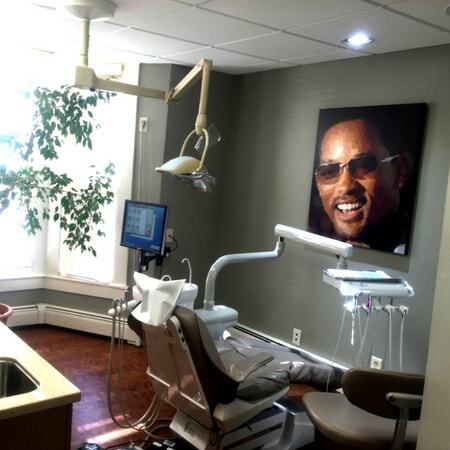 What sets Dental Health Care of Woburn apart from other dental practices? Modern technology: Our Woburn dental office is equipped with the latest dental technology, including a ZEISS dental microscope to deliver faster and more precise treatments. Advanced training: Dr. Mancuso completed a course at the ZEISS Training Center to perform endodontic procedures using a microscope to deliver better and faster patient care. Patient comforts: We offer nitrous oxide sedation for patients who are nervous about their dental visits. We can help you relax (and dare we say, even enjoy!) your dental experience so you can receive the oral care you need. The staff is always incredibly friendly and helpful. I just had a root canal with Dr. Trainor, and as far as root canals go, it was the fastest and easiest one I’ve ever had. I had NO discomfort during the procedure, and once the Novocain wore off, the discomfort was very little and controlled with Advil and the next day, I didn’t hurt at all. Dr. Trainor is a great dentist, and nice guy and their staff are phenomenal. Equipment is state-of-the-art, which seems to find problems my old dentist didn't see when I was there. I have needed periodontal work, and oral surgery and both specialists were at Dr. Trainor's office. I highly recommend this practice to anyone needing gentle care. First-rate dental office - caring personable staff, excellent attention to all details and most importantly, clear explanations of the work that needs to be done, how it will be performed and completed with a minimum of patient discomfort! Have Questions About Microscope Enhanced Dentistry? Our Woburn dentists answer your questions below. What is the added value of a microscope in general dentistry? Although most dental practices do not use microscopes, many dental procedures can be performed more accurately and more reliably with higher magnification tools. Better illumination and visualization allows a dentist to detect problems earlier and deliver more accurate and precise procedures. 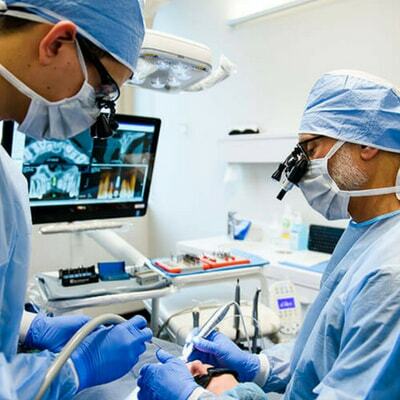 How does a microscope improve root canal procedures? Most procedures during a root canal take place inside the tooth and are performed using the dentist’s knowledge of tooth anatomy and x-ray findings. The dental microscope displays the inside of the tooth, so your dentist can see what is being treated and where. Complete removal of the dental pulp or old, insufficient root canal fillings, and identifying any fractures can reduce the need for re-treatment and help your root canal treatment last longer. How does having microscopes in your practice enable you to provide better patient care? Microscopes give dentists increased precision and a higher level of confidence in the preparation stage of treatment. Removing all decay and accurately identifying issues inside a tooth root or on the surface means a patient will experience longer-lasting restorations and fewer complications. Microscope enhanced dentistry helps your dentist diagnose problems early and effectively communicate these problems to you to help you understand treatment recommendations, especially if you are not experiencing any symptoms. I'm looking for a new dentist in Woburn. Do you offer any specials? We would love to have you join our dental family! You can learn more about our specials to welcome new patients and our financing options on our New Patients page. Ready to Experience Microscope Enhanced Dentistry for Yourself? Enjoy the benefits of advanced dental technology at our Woburn dental office. Dental Health Care of Woburn, P.C. Dental implant patients: Please mention our special in this section. Claim Your New Patients Offer!